UNITED NATIONS, September 23 -- As the UN's "Group of Friends of the Secretary General on Myanmar" met Wednesday in the UN's basement, in the penned in area outside, the talk was of backsliding. Despite the near rote talk about Aung San Suu Kyi, the U.S. is said to be ready to "engage" with the military government of Than Shwe. 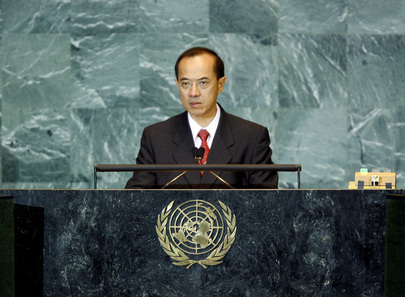 And when Singapore's foreign minister George Yeo emerged, he said he welcomed Hillary Clinton's statement. Inner City Press asked, what about the upsurge in violence against ethnic groups, such as in the Kokang regions, leading to refugee flows? The Singaporean minister said that was not discussed, that "drugs" were not discussed, only refugees. Despite this cognitive dissonance, Inner City Press asked if he thought the UN should provide electoral assistant -- just cut off to Honduras -- since the Myanmar constitution devotes seats to those with military background. That is not a bad thing, the Minister asked, the involvement of the military. Video here. Friends on Myanmar, indeed. The contradiction of suspending election aid to Honduras, but moving to provide it in Myanmar, will be explored. Earlier on Wednesday, Inner City Press asked Kazuo Kodama, Press Secretary for the Prime Minister of Japan, for his country's position on Myanmar. Tellingly, the issue did not come up in the Prime Minister's meeting with Barack Obama. But, it emerged, it did come up in his meeting with the UK's Gordon Brown. The spokesman added, as if by rote, the Aung San Suu Kyi should be freed. Later, the Japanese foreign minister came out of the Friends' meeting and took two questions in Japanese, none in English. Presumably, he did not respond to the calls that Japan divest of Nippon Oil Exploration (Myanmar), with a stake in natural gas in the country. We'll see. UNITED NATIONS, August 13 -- In a weakened and belated response to Myanmar's sentencing of democracy leader Aung San Suu Kyi to 18 more months of house imprisonment, the UN Security Council on Thursday afternoon issued a "press statement" that touted Myanmar's sovereignty and noted Than Shwe's reduction of the sentence from three years hard labor to 18 months at home. 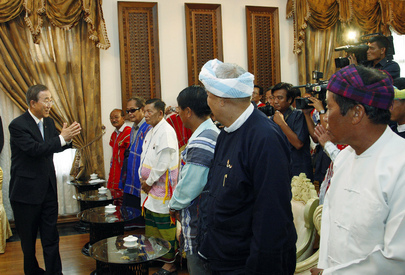 Inner City Press asked the Council President for August, UK Ambassador John Sawers, if there had been any discussion of the credibility of the 2010 elections, even if Suu Kyi were released, given the limitation of top posts to those with military backgrounds. Sawers answered at length that the Council supports national reconciliation, that the elections must be inclusive, that Secretary General Ban Ki-moon has said that. Many read the press statement as heavily influenced by China, with its indirect praise of Than Shwe's mercy and Myanmar's sovereignty. The weak press statement came less than 20 hours after U.S. Ambassador to the UN Susan Rice told an audience at New York University that she is working well with China and Russia, even fielding the latter's ambassador's call on the way to the NYU speech. The U.S. had proposed a stronger Presidential Statement, but it was delayed and watered down. As Inner City Press wrote in its review yesterday of Rice's speech, for Rice to say China and Russia are cooperating reflects to some a devaluing of the importance of such issues as the dictatorships in Myanmar and Zimbabwe, the slaughter of civilians this year in Sri Lanka, to say nothing of killings in Xinjiang Uighur Autonomous Region, Chechnya and Ingushetia. Working well together? France too may care less about Myanmar than it lets on. While President Sarkozy speaks of sanctions, France-based oil company Total continues doing business in the country. 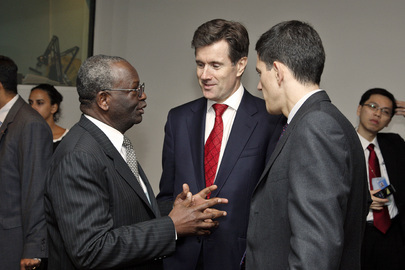 The same of true in Sri Lanka of UK-heavy financial firms such as HSBC and Standard Chartered. So where is the beef? Inner City Press asked Sawers about the additional European Union sanctions which France, despite and without changing Total's investments, proposed on August 11. Sawers said, in his national capacity, that the EU continues operations on this and a decision is expected in a day or two. There was a ruling earlier on Thursday -- but it does not impact Total or many other European financial investments. Footnote: In further reporting on Ms. Rice's speech, Inner City Press has learned that it was written, at least initially, by speech writer Warren Bass in Washington. Thus, to be fair, perhaps the omission of Africa in the lede, which Inner City Press noted, is attributable to Bass and not Rice. But the lack of focus on reform goes beyond its mention or non-mention in a speech. And it was Ms. Rice herself who opined she's working well with China and Russia. If Thursday's outcome on Burma is any indication, the commitment to human rights is taking a back seat. Watch this site. "Due to restrictions by Indonesian police, a revised program to discuss the Burma democracy movement’s transitional / national reconciliation package with Indonesian parliamentarians, politicians and Indonesia-based diplomats and NGOs will take place only briefly tomorrow, Wednesday, August 12. The original two-day program, will now be shortened to a one-day program where from 9 am -11 am a briefing will be held for invitees and participants at the Sari Pan Pacific Hotel and then continued in the afternoon from 2-5pm at the Indonesian parliament, hosted by the PDI-P caucus at their office. There are no scheduled events or meetings and NO press conference on August 13." "What is intriguing about your items on 5 and 8 August is that the 'Trio' seems to include both Sein Win (NCGUB) and Maung Maung (NCUB). 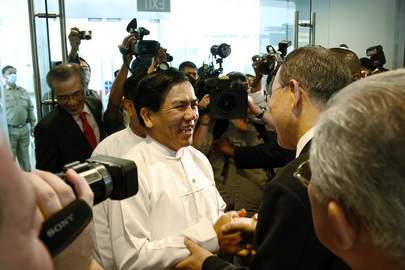 Last year, against SW's advice, MM tried to "unseat" the Myanmar delegation. MM knew it was just propaganda, but he is a better politician than SW. If they have really come together, that is news. Of the Trio who met you, only Bo Hla-Tint is an elected NLD Member. Maung Maung is the darling of AFL-CIO, the ITUC an the Italian Trade Union Confederation, but was not elected in 1990. Sein Win is PND (Party for National Democracy) and a cousin of Suu Kyi whose brother Aung San Oo, a US citizen, married Le Le Nwe Thein who must have a brother I assume to be Sein Win. 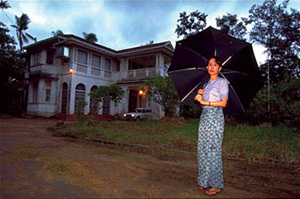 Suu Kyi and Aung San Oo are fighting for possession of 54 University Avenue which has supposedly just been "sold" by family proxies for Aung San Oo, a sale which Suu Kyi is currently contesting. Sein Win, wisely, keeps well out of this family squabble. The UN Security Council's deliberations will continue. Watch this site.